What will global warming bring to the future of Sahara? As the major hot desert in the world, Sahara represents one of the most important examples of how climate on Earth changed during the latest thousands of years, and how these changes could go on in the future. Covering the greatest part of North Africa, with over 9 square kilometers of extension, moving from the western Atlantic coasts to the Red Sea on the East, this vast formation could be the key to some new climatic systems which are thought to appear in the few decades. This could also bring huge social problems in the nations involved. Could looking at the past of these areas help scientists in forecasting their future scenario? Maybe we could get some trustworthy models, as we have lots of paleoclimatic data on how the desertification evolved in human times. 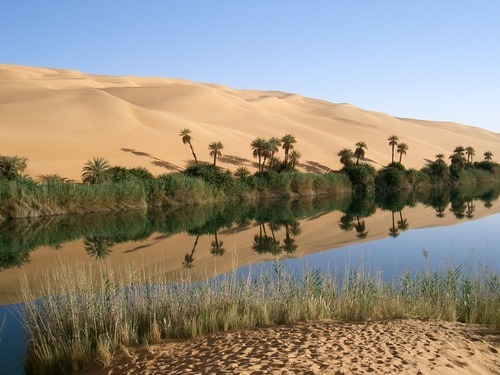 As we know for sure, during mid-Holocene, 9000 to 6000 years before present, most parts of the Sahara were covered with lush vegetation, mainly grasslands (1). Still, scientists are looking for a reliable forecast. A greener future or a drier one? One of the greatest debates among climate scientist regards the future scenario of these areas, which is undoubtedly one of the most difficult to preview. This because the effects of higher temperatures due to human-caused global warming could change things in an unexpected way: some territories in the Sahel, the transition part between the Sahara desert to the North and the central Africa savannah to the South, could in fact become surprisingly greener. During the latest decade, satellite images studies revealed that many different areas of the southern borders of Sahara became covered by lush vegetation in few years (2). How could this be possible? It seems that the key to this unexpected change is an increased rainfall rate, due to augmented evaporation and the bigger capacity of holding moisture of hot air. Among the possible causes of this increased rainfall rate we can find a bigger difference in atmospheric pressure between Sahara and the Atlantic Ocean, leading to more moisture-rich air moving eastwards. Other models include sea surface temperatures, or even high altitude winds, which disperse monsoon rains on the desert areas below. Still, these observations and forecasts should be taken carefully, as Sahel also faced some of the most terrible droughts on Earth, which lead to terrible humanitarian emergencies in the latest decades. A greener Sahel is just one of the possible evolutions of the current situation. Another extremely important aspect in the studies on the effects of climate changes is the possible evolution on human societies: a recent study by John O’Laughlin et al. (3) looked for a likely relationship between global warming and the conflict risk in Eastern Africa, showing that higher temperatures could raise the possibility of new violence. Furthermore, the current global warming is caused by increased greenhouse gases in the atmosphere, a completely different starting point from the one of mid-Holocene: during this prehistoric period, in fact, the strong rainfall rate was most likely caused by low atmosphere pressure areas, generated by the European glaciers melting. A well-known study on climatic change in Northern Africa from the Max Planck Institution (4) clearly stated that, even if a scenario in which parts of the desert become greener for global warming is plausible, it’s fairly unpredictable that these changes will lead to the lush vegetation of the mid-Holocene. 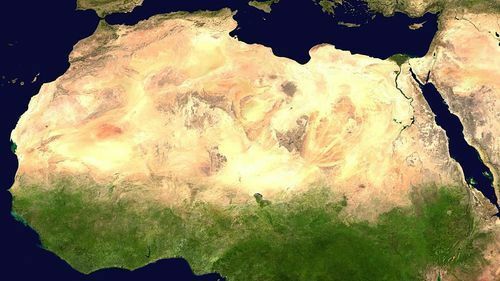 By the end of April 2014 a team of Stanford scientists communicated the results of a long study on computed climatic models (5), which stated that some weather systems on the Sahara desert should be intensified by the effects of global warming, bringing many changes on Earth scale, not just on regional areas. These results confirmed that some parts of the southern Sahara could face a higher rainfall rate, but, on a wider scale, the well-known African Easterly Waves should also increase. These weather systems, also called AEWs, which form above northern Africa and travel east to west towards the Atlantic Ocean, should bring dramatic changes (6): they could influence the creation of stronger hurricanes in the mid-Atlantic Ocean, as well as uplifting and transporting dust out of Africa and across the sea, removing life-sustaining nutrients from the soil and also affecting rainfall and air quality as far away as the Caribbean islands. An animated gif from the Stanford study explains how this works. The Sahel belt covers the territories of many different countries. Even though the common policy showed by African representatives on International summits regarding global warming often stated that little help was provided by developed countries towards them, every nation had different ways to tackle climate change. In the latest four decades, the endorheic basin of Lake Chad, which represents one of the most important resources of freshwater in the four nations which include it (Nigeria, Niger, Chad and Cameroon), has faced a dramatic reduction, which led to huge environmental and social problems. Global warming is one of the main causes of the basin reduction, but not the only one: irrigation and river damming for hydroelectric purposes took their part in this process, but it’s the combined result of these different factors the actual cause to the dramatic situation nowadays. At the moment, the lives of fishermen and farmers who live along the shores of the basin are on the brink. In the 1960s, a first draft of a recovery plan was proposed: the idea was to divert waters from the Ubangi river, the largest right-bank tributary of the Congo River, to the Chari River, which empties into Lake Chad. The aim was to reduce the basin shrinking, which was already taking place, helping local farming and fishing activities. In April, 2008, the Lake Chad Basin Commission (LCBC), an intergovernmental organization of countries near to Lake Chad, which coordinates actions that might affect its waters, advertised a request for a feasibility study on this project. In October 2010, at the opening of the African World Forum on Sustainable Development in N’Djamena, Chad, Nigerian President Goodluck Jonathan asked the leaders of the LCBC member countries to take action in order to save the lake, as still no common strategy has been decided to tackle the menace of its disappearance (7). As one of the most developing countries in Africa, Ethiopia is now taking action against global warming in an unprecedented way, merging its economic growth with a sustainable policy. The country’s Climate Resilient Green Economy Strategy (8), published by the Ethiopian Government led by Meles Zenawi in 2011, is clearly stating than all new carbon-free technologies will be involved in the modernization of the country led by the unprecedented economic growth of the last decade. The focal points of this policy include improving crop and livestock production practices in order to gain food security and raise farmers’ incomes while reducing emissions, protecting and re-establishing forests and increasing green energy productions for local markets. With this policy, the Ethiopian government aims to achieve middle-income status by 2025 in a carbon neutral way, trying to take action in fronting climate change events, which lead to dramatic changes in seasonal rains during the last years (9). Sub-Sahara environment, which is the borderline between human stable environments as cities and cultivated territories, will be the key area in which social problems should become harder; these events will also touch a great part of the population of the Muslim world. In particular, about 250 million Muslims live in these territories, and climate changes will be more evident there, as their transition state is particularly fragile. Droughts, floods and hard increases in average temperatures will strongly damage the lives of the farmers, as the already arid environment in which they grow their crops should become unsuitable for farming in just few years. In order to get prepared to these events, farmers from Sub-Sahara – mainly from Kenya and Uganda – created a training manual (10), with helpful instructions based on traditional and sustainable Islamic farming, which should prevent the damages led by climate change. This should bring major food security in very poor regions, resuming precious advice from tradition. Another huge group of people which is nowadays strongly affected by increasing droughts in these areas are Muslim herders. In order to help these people, an innovative humanitarian project, based on an ancient Islamic tradition, the “takaful”, has taken place in northern Kenya in the latest months. This is basically an insurance, suitable with the religious beliefs of the participants, in which a group of risk-sharing people sign a contract called “tabbaru”, collecting a specific amount which will be used for refunding damages caused by droughts or similar adversities (11). This first experiment of an insurance compatible with Muslim beliefs could create a strong example for future social issues in herding and many other fields in all Islamic nations hit by the effects of climate change. At the moment, this first project seems to work efficiently, as the first refunds were paid to 101 herders in april 2014; this is a significant result, as the project doesn’t lead to any profit, being basically a humanitarian task. So, how will the future climate of Sahara be? Scientists still do not agree. Some of them, as Haarsma et al (12), predict an increase in rainfall, leading to the rebirth of the savannah-like environment in the mid-Holocene in areas like Sahel, others, like the Intergovernmental Panel on Climate Change (13), say that at this moment the assessment is uncertain, others still figure a drier scenario, with decreased rainfall and a likely growing desertification on its surrounding areas. The vastness of the territory involved and the huge amount of factors shaping its climate still lead to different interpretations, making the creation of an unique view on the future Sahara climate extremely difficult at the moment. Another huge study on Western Africa agriculture made by the International Food Policy Research Institute (IFPRI) (14) shows clearly the complexity of these issues, as many different aspects in both human societies and natural landscapes are involved. Furthermore, all different policies led by the several countries belonging to these areas will make harder to find a common way to face these problems. By the way, monitoring the evolution of the environment in the next few decades will have a fundamental role in understanding how climate works on these regions, and how it will evolve and change the lifestyles of their people. Life of humans and other organisms in Northern Africa, and most likely in many other parts of the world, will be strictly affected by the climate changes of the Sahara, so these studies will have a key role in the future, in order to develop valuable survival strategies. Per celebrare i 45 anni dello sbarco dell’uomo sulla Luna, ecco un documentario dedicato all’epopea delle missioni Apollo, in compagnia di Luigi Pizzimenti e Paolo Attivissimo, che ci raccontano aneddoti, curiosità e l’incontro con alcuni degli astronauti che camminarono sul suolo lunare. A farci da cornice, lo splendido padiglione dedicato allo spazio del Museo del Volo di Volandia, a due passi da Malpensa.